During his visit of the United States, General Raheel Sharif met with members of the US administration, Congress, Senate and military and discussed crucial matters such as Afghanistan, the military operation in North Waziristan and Indian aggression on the Line of Control. It is very unfortunate that the head of the world’s seventh nuclear capable army is on a week-long visit of America, the enemy of Islam, the Muslim Ummah and Pakistan, briefing them on matters related to Pakistan and the region. Does the history of Pakistan-US relations not tell us that America always leaves Pakistan high and dry after securing her objectives? She did not assist Pakistan in the 1965 or 1971 wars against India and also left Pakistan alone after the withdrawal of USSR from Afghanistan to face the aftermath single handedly. After knowing this well-established US characteristic, helping her to secure her interests in the region and complaining about Indian aggression to her portrays Pakistan’s image in front of the whole world as a slave of the US. Asking the US to get involved in the critical matters of this region is indeed like asking a wolf for help. India is escalating the situation at the Line of Control with complete US backing. America wants to make India strong so she can safeguard her interests and confront and limit China’s power and use her against the 500 million Muslims of the region. In order to achieve these objectives, America completely supports her loyal agent, Narendra Modi, militarily, economically and politically. At the same time, America has a vision regarding Pakistan that she should not be able to pose any threat or obstacle against India in her voyage to become a regional power. To do so, America, with the help of traitors in the political and military leadership, have kept busy the magnificent Muslim army of Pakistan in long and never ending small conflicts in the tribal areas. 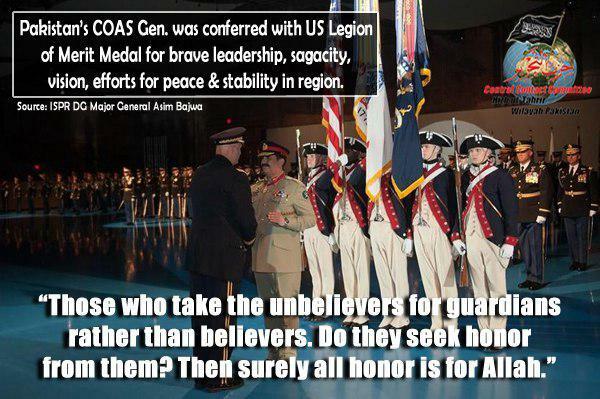 General Raheel must remember that his brother earned the highest military award of Pakistan, “Nishan-i-Haider”, because he fought against Indian aggression and embraced martyrdom, while he has been awarded military award from America in recognition of his turning a blind eye to the US plan to make India powerful. The Muslims of Pakistan and its army must remember that obeying US dictates will always lead to a great harm to Muslims of Pakistan and its army. "اے ایمان والو! اگر تم کافروں کی باتیں مانو گے تو وہ تمھیں ایڑیوں کے بل پلٹا دیں گے، پھر تم نامراد ہوجاؤ گے"